Two years ago, Freedom and Summer arrived to the sanctuary. They were only a few days old and had already suffered immensely at the hands of humans. As "discards" of the dairy industry, these two male calves were sent to auction at only a few days old. 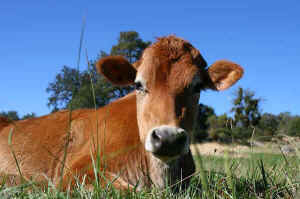 For dairy cows to produce milk, they must give birth to a calf. Half will be male, half female. 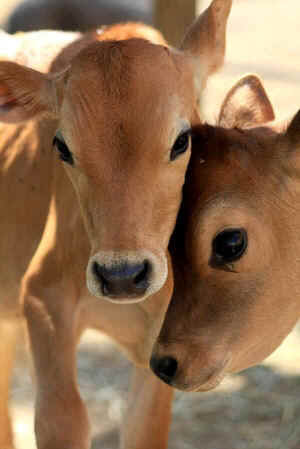 A male calf will be killed for veal or "cheap dairy beef". 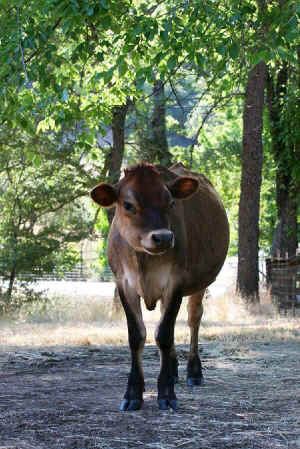 The female calf will replace her mom when she is sent to slaughter at the young age of four or five. Like almost all dairy calves, Summer and Freedom never drank their own mom's milk! In fact, more than 65% of dairy calves are removed from their mother immediately after birth and almost 80% of all dairy farms separate calves from their moms within twelve hours of birth. 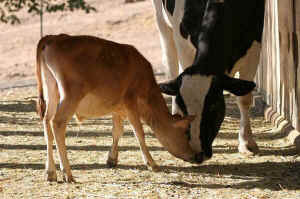 Almost no calf spends more than 24 hours with their own mother. Summer and Freedom found solace at the sanctuary in Sadie. She is a Holstein, the most common breed in the dairy industry. Sadie never knew her own calves, so she loves any opportunity to mother incoming calves. Summer and Freedom are her "kids", so to speak, and even now, as they enter their teenage years, Sadie does her best to keep the two youngsters in line. When they wander too far, she calls them back, and they begrudgingly return for a grooming. This month, Summer and Freedom turn two. They are growing up beautifully!